When you install a TV mount, the first step is to determine how high to place it on the wall. TV height can be tricky, because you are dealing with the varying eye-levels of those watching and want to make sure that everyone has the best viewing angle. 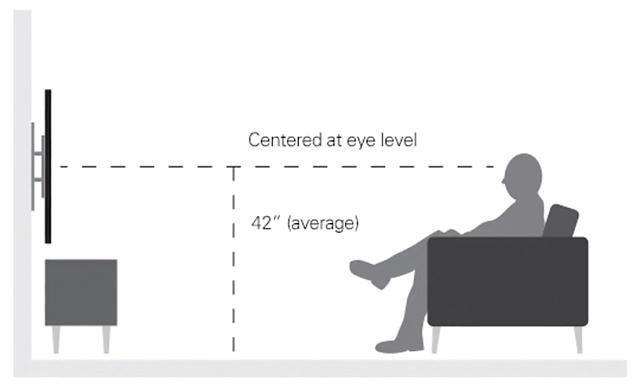 From a seated position, eye level is generally about 42 inches off the floor. But you may be mounting on a wall that has to take into account different pieces of furniture or the clearance for a soundbar. Or maybe you want to mount your TV above the fireplace. There are a few things to think about when determining how high you should mount your TV. First of all, take into consideration how you watch your TV. Is it always while seated on the couch or do you watch it while standing frequently? Or is it a combination of both? One of the great things about a mounted TV that swivels and tilts is that you have more flexibility to adjust your TV to the ideal angle you are going for. However, if you frequently watch your TV while standing, you may want to mount the TV higher than someone who always watches it while lounging on the couch. ProTip: The industry guideline of 42” is lower than you may expect, but it is recommended for the best quality and the most comfortable view thus avoiding any nasty neck strain. Once you know the height at which you would like to mount your TV, use the SANUS HeightFinder Tool to find out exactly where to drill holes into your wall. 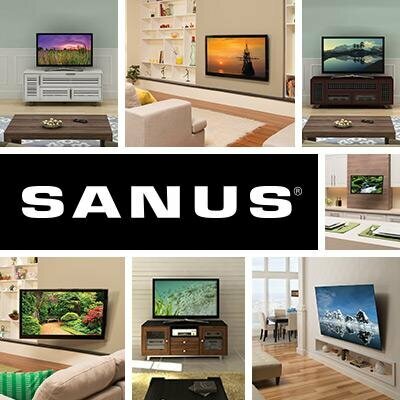 It takes into account the exact SANUS mount and TV model you have so all you need to do is enter your information and get the results. The tool takes the guesswork, and math, out of the installation process making it super simple!